"Secret Weapon" can only be described as pure electronic indie pop brilliance. From the catchy hook in the opening track, "Split in Two," to the powerful guitars on the rock epic "I Was Born to Get High," "Secret Weapon" is a musical journey that transcends various emotions and musical styles. 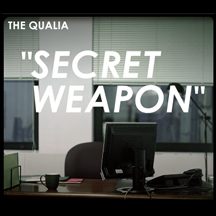 The songwriting on The Qualia's sophomore release showcases a more mature Lars Casteen and his vocals can be compared to Colin Meloy of The Decemberist. We had our first glimpses of "Secret Weapon" with the release of "Volcanoe" on the R3 compilation and with the digital release of the single "Station Wagons" on March 9th.